The CVSA Cup traces its roots to the beginning of the CVSA, with the first competition being held during the 1975-'76 season. The basic idea of the competition is to have all teams in the league participate in one inclusive tournament. It generally lasts from the fall to the spring, with games played intermittently during the regular season. The tournament gives an opportunity for lower division teams to test themselves against higher competition within the league. The Cup is one of the four major titles awarded by the league in a calendar year. The others are the Premier Division Spring Champion, Premier Division Summer Champion, and Premier Division Fall Champion. The trophy awarded to the winners is named for the late Arthur Ballner of Deutscher Sportclub. Mr. Ballner is one of the pioneers of adult amateur soccer in the Richmond area. In the late 1950's he led a group that started playing pickup soccer games near Byrd Airport, and became Deutscher Sportclub in 1960. Throughout the 1960's, he led the Deutscher Sportclub teams to play in Washington, D.C. leagues on weekends, as there weren't enough players to support a league in Richmond at the time. Their teams were good enough to win the D.C. Second Divison at one point. As the game grew in the Richmond area Mr. Ballner branched off and founded the Internationals Soccer Club, the precursor to the very first CVSA Champions in the 1975-'76 season, and winners of two of the first three CVSA Cups. Mr. Ballner passed in 1972, three years before the founding of the league, but his enthusiasm and love of the game laid the groundwork for what is now the CVSA. For the 2018-'19 season, the CVSA Cup is to be contested by 35 teams: the nine Premier Division teams, nine First Division teams, nine Second Division teams, and the nine Third Division teams (one team is ineligible). The lower cup competition, the Copa Bruce, is to be contested by the remainder of teams of the lower divisions who wished to enter. The Copa Bruce is named for longtime CVSA President S. Bruce Williams, whose idea it was to give the lower division teams a legitimate chance in cup competition. Mr. Williams led the coalition of community, business, & municipal groups who developed the Bryan Park Soccer Complex in the mid-1990's, which the CVSA uses as their primary base of operations. Mr. Williams is still active on the Richmond soccer scene, and is a leading offensive component for the Lions Masters of the CVSA Veterans Division. Partizan Richmond FC is the current holder of the CVSA Cup, winning the 2017-'18 tournament with a 2:0 victory over the CVSA's Cinderella story, the 2016-'17 Copa Bruce Champions Absolute B.C., in the championship game at Bryan Park on July 14, a replay of the rained out game from June 2 at City Stadium. This title was the fourth for Partizan Richmond, separating them from the X-Rams and Fan Rats, and evening them with Deutscher Sportclub, in the number of CVSA Cup titles. 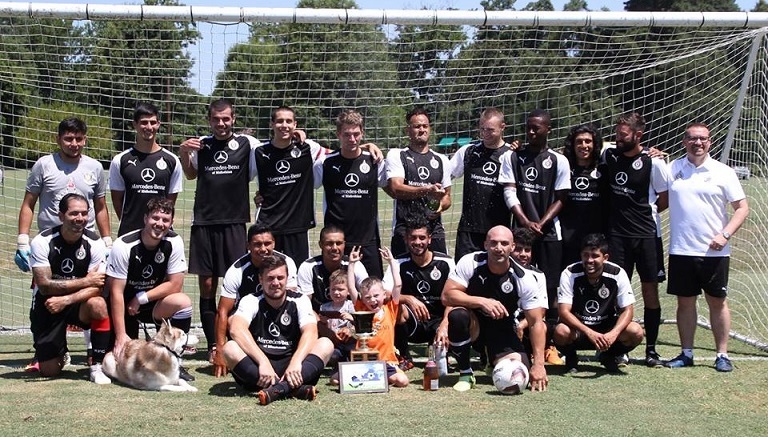 For The Strongs, they have known nothing but success in the CVSA, winning the three regular season titles for which they have competed, and now having a Copa Bruce Championship of their own with a 2:1 victory over Richmond is for Haters on June 2 at City Stadium. Three games randomly drawn amongst the nine Premier Division, nine First Division, nine Second Division, and nine Third Division teams. Home teams are listed first. Ties will be settled by penalty kick shootout. Any teams forfeitting are ineligible for 2019-'20 cup competition. Richmond City FC II is ineligible due to a forfeit in the 2017-'18 CVSA Cup. 16 games randomly drawn amongst the three CVSA Cup First Round winners, and the 29 CVSA Cup entrants receiving a First Round bye. Home teams are listed first. Ties will be settled by penalty kick shootout. Any teams forfeitting are ineligible for 2019-'20 cup competition. Eight games randomly drawn amongst the 16 CVSA Cup Second Round winners. Home teams are listed first. Ties will be settled by penalty kick shootout. Any teams forfeitting are ineligible for 2019-'20 cup competition. Four games randomly drawn amongst the eight CVSA Cup Round of 16 winners. Home teams are listed first. Ties will be settled by penalty kick shootout. Any teams forfeitting are ineligible for 2019-'20 cup competition. Two games randomly drawn amongst the four CVSA Cup Quarterfinal winners. Home teams are listed first. Ties will be settled by two 15-minute golden goal overtime periods, then a penalty kick shootout. Any teams forfeitting are ineligible for 2019-'20 cup competition. The winner of the first pairing drawn (*) will be the home team in the CVSA Cup Final. CVSA Cup Semifinal winners. A tie will be settled by two 15-minute golden-goal overtimes, and then a penalty kick shootout if necessary. Nine games randomly drawn amongst all interested CVSA teams from the Fourth, Fifth, Sixth, Seventh, Veterans, Coed Competitive, & Coed Recreational Divisions. Home teams are listed first. All Coed teams entered in the Copa Bruce may have no more than seven men on the field at any time. All Veterans teams must consist of players born 1978 or before. Ties will be settled by penalty kick shootout. Any teams forfeitting are ineligible for 2019-'20 cup competition. Random drawing amongst the nine Copa Bruce First Round winners, and the 23 Copa Bruce entrants receiving a First Round bye. Home teams are listed first. All Coed teams entered in the Copa Bruce may have no more than seven men on the field at any time. All Veterans teams must consist of players born 1978 or before. Ties will be settled by penalty kick shootout. Any teams forfeitting are ineligible for 2019-'20 cup competition. Eight games randomly drawn amongst the 16 Copa Bruce Second Round winners. All Coed teams entered in the Copa Bruce may have no more than seven men on the field at any time. All Veterans teams must consist of players born 1978 or before. Home teams are listed first. Ties will be settled by penalty kick shootout. Any teams forfeitting are ineligible for 2019-'20 cup competition. Four games randomly drawn amongst the eight Copa Bruce Round of 16 winners. All Coed teams entered in the Copa Bruce may have no more than seven men on the field at any time. All Veterans teams must consist of players born 1979 or before. Home teams are listed first. Ties will be settled by penalty kick shootout. Any teams forfeitting are ineligible for 2019-'20 cup competition. Two games randomly drawn amongst the four Copa Bruce Quarterfinal winners. All Coed teams entered in the Copa Bruce may have no more than seven men on the field at any time. Home teams are listed first. Ties will be settled by two 15-minute golden goal overtime periods, then a penalty kick shootout. Any teams forfeitting are ineligible for 2018-'19 cup competition. The winner of the first pairing drawn (*) will be the home team in the Copa Bruce Final. Copa Bruce Semifinal winners. All Coed teams entered in the Copa Bruce may have no more than seven men on the field at any time. A tie will be settled by two 15-minute golden-goal overtimes, and then a penalty kick shootout if necessary.